Please visit our website irishnationalcaucus.org and our blog for more information on this acclaimed book. To order ONLINE go to: www.irishnationalcaucus.org and click “Buy Now”. The Holy Land and Ireland are joined in this Third Edition of Fr. Mc Manus’ Memoirs. 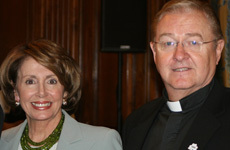 Having struggled for over forty years to get America stand up for justice and peace in Ireland, Fr. Mc Manus turns his attention to The Holy Land, dear to the heart of Irish people the world over. The Irish are deeply conscious that the British Government partitioned both Palestine and Ireland in England’s imperial and colonial interest. When concerned Americans asked Fr. 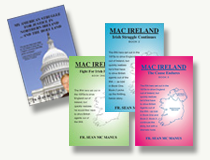 Mc Manus’ help in exploring if a Mac Bride Principles-type campaign could be applied to The Holy Land, he responded, “How could I say no? I believe American principles should follow American investment – no exceptions!” This new Edition recounts Fr. Mc Manus’ visit to The Holy Land. Most importantly, however, the book launches his historic initiative: the launching of the Holy Land Principles just as he did the Mac Bride Principles on November 5, 1984. 1. The campaign for the Holy Land Principles will be conducted through Shareholder’s Resolution and through public education. 2. This book [My American Struggle for Justice in Northern Ireland … And The Holy Land] with a personalized letter will be sent to the CEOs of all 573 companies – plus their Investor Relations Contact — doing business in The Holy Land (Israel-Palestine, West Bank/Gaza Strip). The letter urges them to sign the Principles. 3. This book with a personalized letter will be sent to all Members of Congress, House and Senate, urging support for the Principles. The book will also be sent to all key media personnel. 4. An extensive Direct Mail campaign will be conducted to prospective supporters – Americans of good-faith, especially Irish-Americans, Arab-Americans and the faith and social-justice communities. – Renowned Jewish historian, Ilan Pappe. The Ethnic Cleansing of Palestine. Page 124. Albion is, of course, the ancient name for England, which for centuries has been nicknamed Perﬁdious Albion.